Kiribati is amongst the smallest island nations of the world. The nation comprised 33 low lying coral islands and atolls scattered along and astride the equator between the 170degrees East meridian and 150degrees west meridian in the central Pacific ocean. This is a stretch of 4,400km between the most eastern and western located islands. Kiribati claimed to be the first country to sight the new millennium and thus renamed its most un-inhabited eastern located island Millennium Island after the occasion. Only 20 of the 33 islands are inhabited. Although the total land area of all the islands put together is relatively small at only 750 sq km the vast ocean area that surrounded the three main groups of islands (Gilbert, Phoenix and Line islands) forming the country’s exclusive economic zone covered roughly 3.5 million sq km of the Pacific Ocean. The population according to the recent census accounted for almost 85,000 persons in Kiribati with a growth rate of 1.8% per annum. The capital South Tarawa with its land area of 16 sq km is home for 43% (almost 37,000 persons) of the total population. The Gilbert Islands as it was formally known before independence in 1979 was colonized by British in 1892. Although Protestant and Catholic missionaries arrived earlier and introduced schools, it was through the British administration that the traditional ways of living began to change significantly. New laws were introduced, cluster of individual extended family hamlets were amalgamated into villages on land taken by the administration from customary landowners. Proper housing layouts were enforced and new roads that usually extend the entire length of the island were built. The islands particularly the capital Tarawa was host to one of the fierce battle grounds between the American and Japanese troops during WW2. Following the British rule, the Gilbert Islands became a sovereign Republic of Kiribati when it gained its full political independence in July 1979. The Head of State became an elected President by the people. The House of Parliament that amended and passed laws consists of every elected MP Representative from all the 20 inhabited islands. A total of 43 seats are available in Parliament. There are usually only 2 political parties in Parliament, one being the ruling Government party at the time and the Opposition party. Adopted from the British administration certain powers of the central Government were delegated to the Island Councils established on every island. The council is made up of councilors elected by residents of the island. Respective island councils has powers over village planning, regulate inshore fishing, taxes and initiate island development projects beneficial to the island that were usually passed to central Government for approval and funding. On the other hand Government has powers over education, health, public utilities, commerce, natural resource development, customs and immigration, environment conservations and planning and land administration. The British administration introduced the registration of land ownership throughout the islands. Traditionally titles over land was passed from father to son or as gift for personal favor while in old age or title passed to daughter when leaving the family in marriage. Transfer of title was reflected in the registers. Unfortunately, probably due to unavailable resources during the administration most customary freehold land registered were not surveyed. Very crude estimations of land sizes however were recorded in the compiled registers. Today disputes over freehold customary titles and land boundaries were common throughout the country. The first cadastral surveys were carried out in 1950s when the British administration entered lease agreements with landowners for public offices, schools, hospitals, airfields and other public purposes developments. Most of these lease lands were on Tarawa the capital. The initial surveys for these leases were not coordinated and tied to any projected mapping datum. Not until the early 1970s that these Government leasehold plots were resurveyed and tied to established controls. Such controls have been further transformed to the geocentric datum WGS84. There has been work however carried out in 1980s by the then Lands and Survey Division to survey all other freehold customary lands that have been registered on every island. The work was tedious and slow since every land boundary has to be adjudicated and confirmed first by the Magistrate court before the location is surveyed. The court boundary settlement is a lengthy process and may even take longer if un-contented owners appealed to the High court against the Magistrate decision over their adjudicated boundary. The Government Land Management Division is responsible for all Government owned and leasehold properties. In addition it’s also responsible for customary freehold and private lands. It managed and paid annual lease rentals to landowners and provides advice to councils on planning and land use issues. 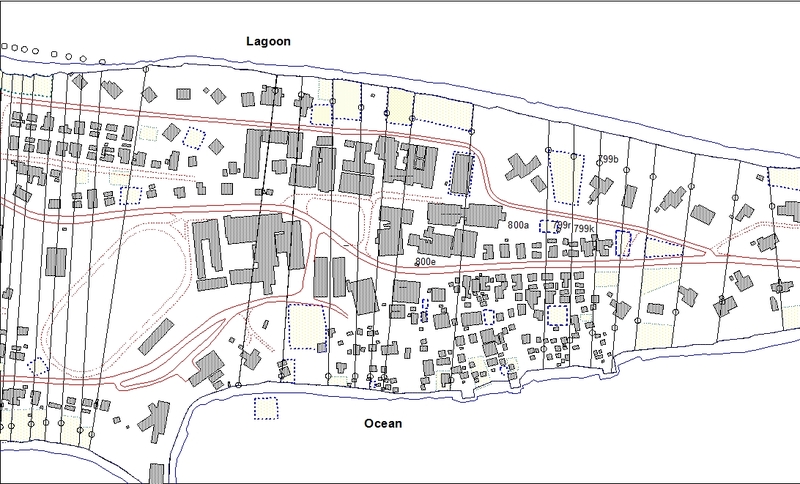 The general land planning responsibilities has just recently been handed over by Government to urban councils on Tarawa the capital and most urbanized island. The Division has developed in 1998 a computerized land information system. The hard-text original freehold land registers that recorded landowner names, traditional hamlet names and plot numbers have been entered into MS Access databases. Through common identifiers, notably the unique land plot numbers allocated to every plot, the text data were integrated with the graphic mapping data in MapInfo. The system has enhanced services to public queries and daily general search for information of any particular land including the map details. Though a significant number of survey works is still required to be carried out on customary freehold plots the system has provided the Division with an efficient management and planning tool to carry out its duties. The system has put greater pressure on the survey unit to ensure that all registered plots are properly surveyed and entered into the mapping database. To meet this obligation the Government has in 2000 passed an Act that survey is compulsory for all land transactions. The implication of the new law was that no further registration of title over land would be valid without the approved survey plan of the plot prepared by the Land Management Division. In Kiribati no private survey practice has been established. All cadastral surveys and establishment of control networks were carried out by Government surveyors. Likewise no professional organization relating to survey and other land management fields has been established in Kiribati. The Division under its current staff establishment employed 6 qualified surveyors who should at least have a certificate in surveying qualification. In addition 6 survey technicians who were usually new recruits would be trained on the job for one year before they are permitted to carry out simple cadastral work under the close supervision of qualified surveyors. Completed cadastral surveys however are checked and approved by the Chief Surveyor. The main responsibility of qualified surveyors apart from undertaking more pragmatic surveys was to ensure that cadastral surveys meets set specifications and follows standard directions before submission for approval. Survey training was undertaken at overseas institutions since none is available in Kiribati. Prior the ethnic unrest in the Solomon Islands our technicians were usually send there for certificate training. Outstanding staff would then pursue further training for Bachelor degree either at the PNG University of Technology or in Australia. Currently there are 3 staff in office with Bachelor degree in surveying. Two qualified from the PNG Unitech and one from Queensland University of Technology. At certificate level we have 3 qualified surveyors from TAFE(Tasmania), New Zealand and Honiara Collage of Higher Education respectively. Due to funding and limited in-service Government training offers it has been difficult recently to send our surveyors for overseas training. Other agencies however such as the Australian Open Equity scholarships offered through AusAid has been an alternative source for funding for our trainee surveyor to undertake survey training mainly in Australia. During the British administration little effort has been made to survey registered freehold lands. This has created burden over the Magistrate courts for settlement and adjudication of disputes over boundaries. Loan institutions have emphasized the need for proper defined and measured plots when such plots of land are place for securities for loan. Likewise willing purchasers would be hampered and reluctant to purchase and develop unmarked and unmapped plots from registered owners. Although land registers have been compiled for every island and updated for every new transaction, the essential cadastral mapping component that legally supported the ownership title over the land has still largely uncompleted for most freehold lands. On Government leased lands however, subleases have been granted by Government to potential developers for business and residential purposes. Every sublease issued is properly surveyed and plotted onto the appropriate layer in MapInfo. The land information system established enables linkage of the graphic data with the text data from the appropriate sublease register in MS Access database. The judiciary that consist of the magistrate courts situated on every island and the only High court in the capital Tarawa is empowered to act as a Land registry office. It is through the Magistrate courts that land transaction has to be heard and endorsed. Subsequent new titles to land pursuant to the recorded court minutes are then entered and the appropriate land register updated. Under Kiribati law triplicate copies of the register have to be made. The original copy held and undated by the respective island magistrate court concerned, the second copy for the High court and the third for the Land Management Division. This was in order to avoid fraud and erroneous entries into the register. The Land Management Division in 1998 has developed a computerized system to link the text data developed in MS Access databases that has replaced the hard copy registers with the survey data developed in MapInfo of the corresponding registered plot. Although not all freehold lands have been surveyed the system is up and running for those plot that has been surveyed and including all Government leasehold lands. Pursuant to the Native Lands Ordinance all customary freehold titles over land has to be registered. The registers records preceding and current owner/s of the plot. Transfer of title over freehold land is reflected in the register with references to the court number where the transfer was endorsed. Ownership over a plot of land, usually narrow strips of land parcels that extends the width of the island from the ocean leeward side to the lagoon, would be registered as a multiple family ownership or as single ownership. Fragmentation of these initial strips could occur when a family member may decide to portion out his share for sale. All plots and further subdivisions were allocated unique plot numbers in the register. The recent review on relevant Acts and Ordinances ensure that the registered title over a plot would be referenced to the survey plan prepared by LMD. The plan of the plot would be identified with the same unique plot number allocated and would show all physical dimensions of the plot and other relevant survey information. Register of land titles: These are registers for all freehold plots held by respective magistrate court on each island. The registers records landowner names, plot number, hamlet name, court case number and plot area. Except for the land registers for Tarawa all other island registers are still in hard copy. For Tarawa the land records have all been entered into MS Access databases. Cadastral Surveys: Survey of registered freehold plots is carried out by Government surveyors. Although a significant amount of work is further required before all registered plots are completely surveyed and mapped the LIS established in 1998 that enables integration of mapping data in MapInfo with the text data in Access data bases is currently running and in use. The data input into the MapInfo tables represent the plot surveyed and coordinated and are identified with the same unique numbers allocated in the register. The boundary descriptions and dimensions would also be shown on the plan. Initially prior 1998 cadastral maps were plotted on transparencies at scales of 1:1250. These plans showed the boundaries of the plot, the unique allocated number and the coordinates of the boundary points and description. Topographic maps compiled from orthophoto maps also plotted on transparencies at same scale of the cadastral maps would be overlaid for planning and identification purposes. Special sheets however would be prepared that merge the two map set together for planning, land use and zoning purposes. When the Division was computerized all coordinated boundaries were plotted onto the setup plot point layer in MapInfo. The base topographical digital data acquired from aerial photography made up another layer. Other cadastral data that include Government Leases, subleases were created forming separate polygons, lines and points. These data forms the spatial cadastral system now in operation. The map below shows the surveyed boundaries of the registered freehold plots identified by its unique plot number. Each plot is enclosed within the bold straight lines extending the entire width of the land from the lagoon high water mark to the high water mark on the ocean side. The cadastral layer that consisted of the survey plot boundaries is overlaid with the topographic data that include buildings, roads, and coastline. The topographic data was obtained by aerial photography. Cadastral layer plays an important role in the Spatial Data Infrastructure although most GIS users are just beginning to recognize its importance. The main reason being that most users’ spatial data systems are in their infancy and compilation stages. The LMD utilized the cadastral layer in its day to day role for managing both Government and private lands. One role that highlighted the importance of the cadastral layer was for planning purposes mostly for Government development projects. In particular the layer would enable easy access to landownership information and assessment for compensation claims when the project is under way. The undertaking of the cadastral survey of customary freehold plots has been the primary issue. Over the last two decades Government has initiated the surveying of registered freehold plots on 4 islands amongst the total 16 islands where customary freehold ownership titles over land exists. Of the 4 islands none was completely 100% surveyed until the project has to be suspended in 2000 for review. The main holdback of the exercise was the disputes that were inevitable between owners and the adjudication of the boundary by the Magistrate Court which obviously was a lengthy and time consuming process. Government surveyors assigned for the task has to sit idle to await the confirmation of the boundary by the court. Considering the exorbitant cost and the time required for the exercise to cover all islands alternative solutions has to be investigated. Coordination of cadastral mapping for all outer islands into a common geocentric datum is as important an initiative as the development of a sound strategic approach for undertaking the cadastral survey of all customary plots on Kiribati. Currently there are project documentations still in its compilation stage where GPS surveying is to be employed to establish and re-coordinate existing geodetic controls onto a geocentric datum. This step is essential to enable the establishment of a national SDI that would encompass all islands of Kiribati onto one system.